The latest Tales game, Tales of Zestiria, comes out in Japan next week, and already it's got a ton of wallet-gouging DLC announced. Character outfits from from the new Evangelion movies. 5 costumes at ￥463 (US$3.93) apiece plus tax. Release date: January 22nd. The iDOLM@STER character costumes. When using characters that are wearing the costumes in battle, the characters' dialogue upon entering battle will change. The battle theme will also change to music from the iDOLM@STER series. Each costume includes 3 or 4 accessories that the characters can wear. 4 costumes at ￥278 (US$2.36) apiece plus tax. Release date: January 22nd. School uniforms for the characters. Each character-specific uniform comes with an accessory that can be used by any character. 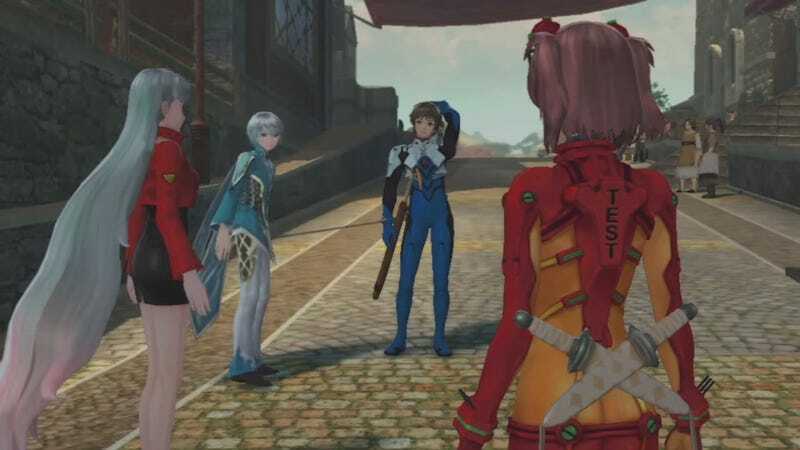 Using a character wearing a school uniform in battle will change the battle theme to a dedicated Zestiria campus theme. 8 costumes at ￥278 (US$2.36) apiece plus tax. Release date: January 29th. Costumes from the popular manga/anime series, Blue Exorcist. Characters wearing these costumes will have alternate victory poses and dialogue. 4 costumes at ￥463 (US$3.93) apiece plus tax. Release date: January 29th. Mascot accessories that characters can wear on their heads. The accessories are of characters from Sengoku Basara 4, 6 in total at ￥185 (US$1.57) apiece plus tax. January 29th. Character costumes from previous Tales games. Using characters wearing these costumes in battle will change the battle theme and victory theme to the music from each specific game the costumes come from. 8 costumes at ￥278 (US$2.36) apiece plus tax. Release date: February 5th. Self explanatory. Using character wearing swimsuits in battle will change the battle theme to a dedicated "ocean resort" theme. 8 costumes at ￥278 (US$2.36) apiece plus tax. Release date: January 29th. You may have noticed that I'm keeping tally of the number of costumes and the individual cost. That's because the grand total for all the DLC comes to a whopping ￥13,061 (US$110.78)! Adding tax, it comes to ￥14,105 (US$119.64)! You could buy an extra copy of the game for that! And this is just for the DLC that's been announced so far. People on Japan's biggest message board, 2ch, quickly chimed in with their opinions. "How nice of them to announce before releasing the game! /sarcasm" one commenter quipped. "Right off the bat they're going with collaborative costumes. Try to be a little more true to your world image." said another. "Compared to this, look at the DLC for Mario Kart 8, it's amazing [Nintendo] released that content for that price" one person noted. Granted, the insanity of DLC is not exactly a new practice for Bandai Namco – if anything, it's par for the course. And while I won't say they should never do DLC ever, it would be nice if they'd tone it down a little. Tales of Zestiria is scheduled for release on the PS3 in Japan on January 22nd and internationally later this year.